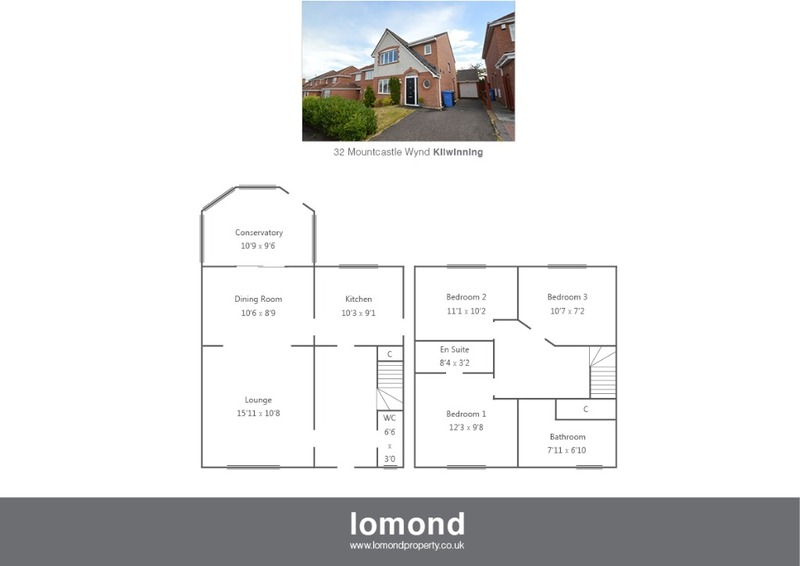 Located in the ever popular Whitehirst Park area of Kilwinning, 32 Mountcastle Wynd is a three bedroom detached house. The property has been extended to the rear with conservatory, and benefits further from a downstairs WC, master en suite bathroom, and off street parking. The layout comprises of entrance hall with storage cupboard, cloakroom wc, and stairs to the upper level. The ground floor space comprises open plan lounge to dining area which in turn allows access to the conservatory. To the rear of the property the fitted kitchen completes the ground and comes with floor and wall mounted units, gas hob, oven and hood. The upper level has three bedrooms (two of which have built in storage), master ensuite and the family bathroom with storage cupboard. Externally the property has private gardens to the front and rear. The rear garden is low maintenance with monobloc, and raised timber decking ideal for summer dining. A tarmac driveway allows off street parking and leads to the detached garage. The garage has been floored and lined and used as an additional room/storage space. On entering Kilwinning from the Pennyburn Roundabout (A738) continue past the fire station and through the mini roundabout. Take left at the traffic lights onto Whitehirst Park Road, follow the road to the roundabout and take right onto Meadow Park Road. At the next roundabout take right onto Dalgarven Wynd and at the end of the road take right into Mountcastle Wynd. Number 32 can be found on your right-hand side.